NYSC has released the main picture of Esi Uwakwe who was slapped by a police officer in Kaura Namoda in Zamfara state. "THIS IS UWAKWE UNHURT! 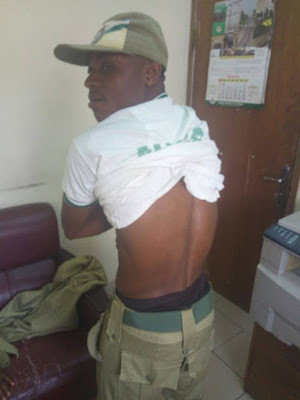 Contrary to the mischief being made online with strange picture of a man with deep cuts on his back, this is latest picture of Corps member Esi Uwakwe, who was assaulted by a policeman in Zamfara State. Uwakwe, who was with us at the NYSC Headquarters yesterday, acknowledged the Scheme's intervention in his case, and has since put the matter behind him. We remain committed to protecting Corps members wherever they are serving while also appealing to other stakeholders to show love and hospitality to them in their various service locations."